A little over a week ago I set out from Jameson Memorial, bound for Colonia. 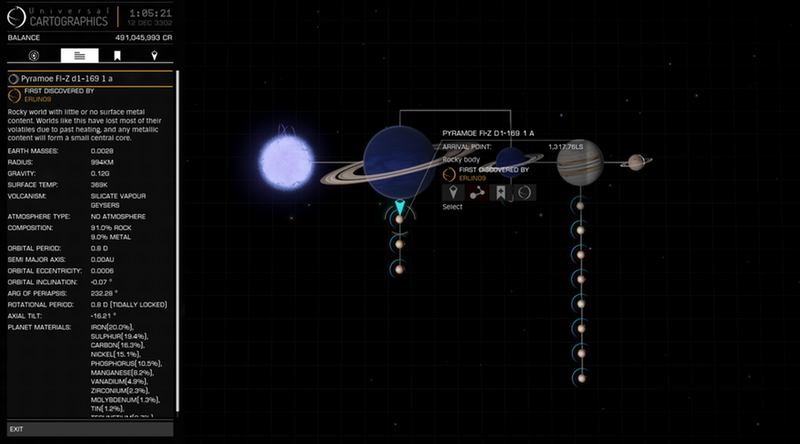 As I write this I’m about 350ly from Eagle’s Landing, midway down the Colonia Highway. 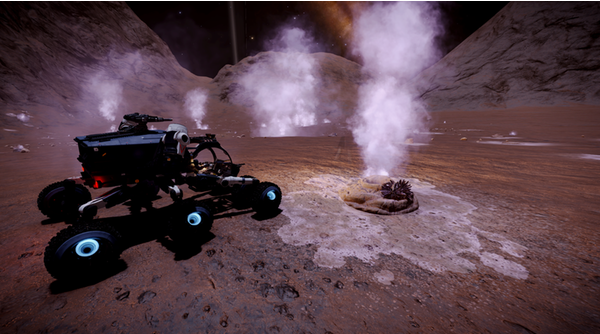 I decided to break up the long 22,000ly trip by trying to find some geysers and/or fumaroles; I’d never seen one in game, since they were added with The Guardians 2.2. I scoured the internets (well, the official forums and Reddit), looking for information on how and where to find them. 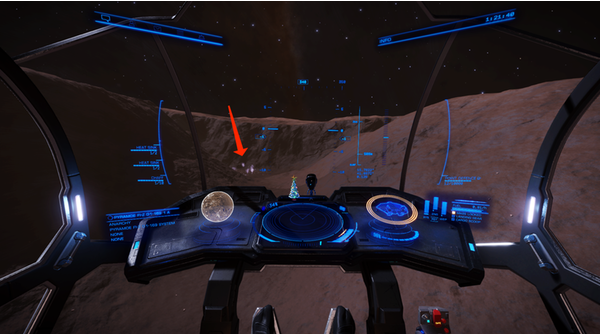 There’s a wealth of it, but after a full week of searching, and countless hours of flying in canyons, I hadn’t yet spotted one. Then, it finally happened, and I nearly cried. Seriously. At this point I was pretty convinced that I was either blind, doing it wrong, or they weren’t actually in the game. After posting about my woes on the official forums, I was given a few more tips and a lot of encouragement, so I put on my big boy pants and tried again. The first tip I was given was to choose the right planet: Rocky or Rocky Ice with a radius of less than 500km. 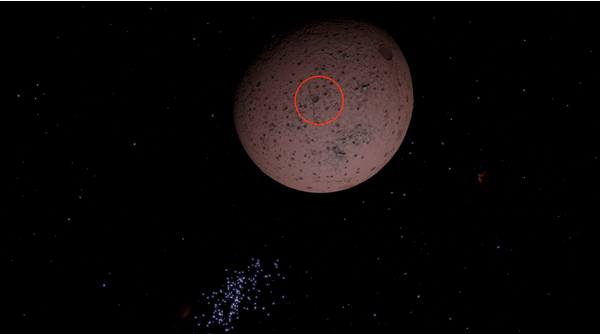 While the one I ended up choosing was slight larger than the recommended size, it was the first Rocky planet with active Vulcanism that I’d come across in a while, so I gave it a go. Once I’d found a good candidate planet, it was time to choose a search area. 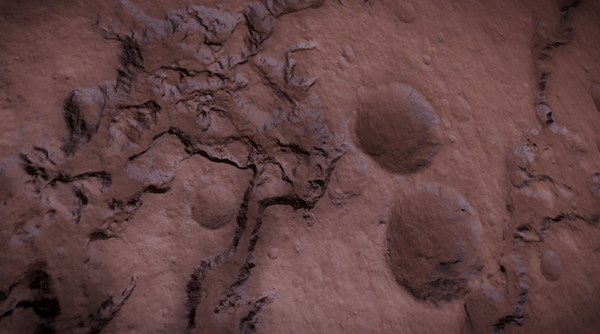 The official forums and Reddit all advise looking for deep canyons, among other low land places, though you’re supposed to avoid craters unless a canyon runs through them. You can see in the image above that I chose an area with some canyons running through impact craters; this meant the canyons were pretty deep. From orbit it looked pretty perfect; a whole series of canyons, visibly deeper than the surrounding impact craters. It was a big search area, so I had my work cut out for me. I hadn’t had any luck flying between 2k – 4k above the deck, looking for sensors contacts, so I decided this time I’d drop down in the canyons like I was hunting womp rats. I had probably been zooming around the canyon floor for a half hour when it finally happened: GEYSER SIGN! I was pretty close to giving up on this site, at this point. I’d promised myself if there was nothing around the next bend, I’d jump to out and look for a system with a smaller, rocky planet. Then I rounded the bend and my heart stopped. Were those puffy, white clouds!? Yes, indeed they were! 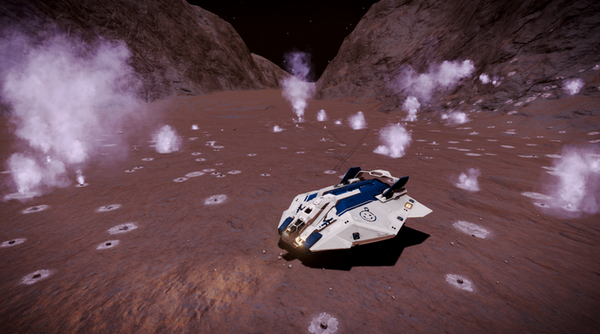 I’d found Silicate Vapor Geysers! 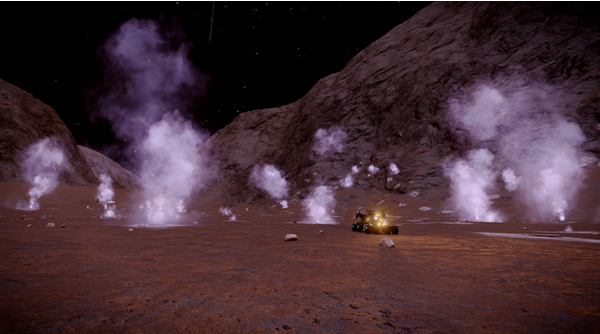 Ever one to test theories, I decided to get up above 2k to see at what point these geysers would appear on sensors. 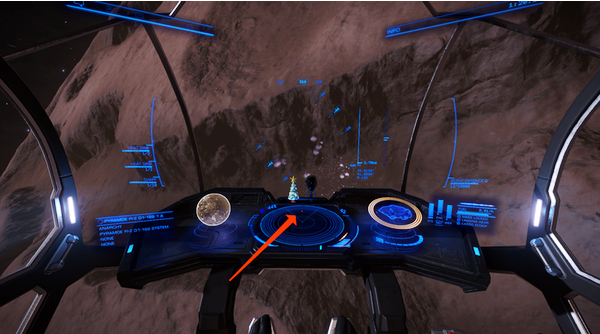 As you can see by the tiny red dot on the scope, indicated by the red arrow, these geysers were visible long before they appeared on sensors. I don’t have any other experience with geyser fields, so I don’t have a basis for comparison, but this one looks pretty big. Here’s a shot of my kitted Asp Explorer, in among the geysers, for scale. They really do look huge next to the SRV. There were also a lot of rare materials growing in crystal formations on the edges of the vents. I put together a video of finding and driving among the geysers. I honestly think this will go down as one of the most memorable experiences I’ve ever had in any game. Enjoy the show.